For more than 15 years, we are working together with companies by supporting them to reach their business targets faster and more efficient with our Content and Digital Asset Management solutions. Our solutions enables organizations to unleash the full potential of their various content. 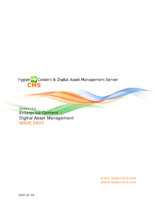 Enterprise Content & Digital Asset Management is needed in all large and distributed organizations, to meet the requirements in advertising, communications, marketing or documentation. To organize, exchange or publish & distribute rich content and for digital rights management. The perfect solution for professional PR. Distribute your press releases including the associated digital media quickly, safely, and effectively to all recipients. To organize, release, publish & distribute, integrate rich content, and for digital rights management. Provide your sales force and partners with the latest information, marketing materials, presentations, and documentation. Ensure that all partners follow your CD, implement a consistent brand management under your control. To organize, protect, integrate, share, release rich content, and for digital rights management. Create a platform for the cooperation with your creative service providers and print shops regardless of their location. Create efficient processes to reach your goals faster and more cost effectively. To organize, release, publish & distribute, integrate information, as well as for digital rights management. Supply your customers and partners quickly with the latest product information and documentation. Publish your information on different channels, such as on your website, in the webshop and on partner sites. To organize, share, review, comment, or archive data. Maintain your documentation from any place and at any time and supporting the rapid and objective assessment of your projects and objects.